The now-legendary V-twin 1946 Indian Chief motorcycle emerged as Indian’s flagship model after World War II. Considered by many as the ultimate expression, this iconic design relegated the American company’s four-cylinder and smaller V-twin models to history. Similar to pre-war big Indians, the 1946 Indian Chief engine remained a 74-cubic-inch flathead and tank graphics were unchanged. As always, ‘Indian Red’ was a popular colour choice, though others, including two-tones, were available. 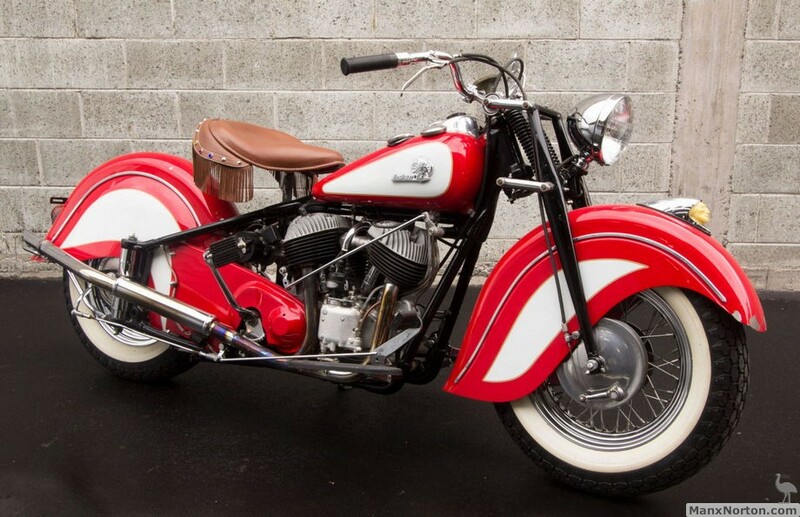 New for the 1946 Indian Chief motorcycle, however, were girder-style could-spring forks adapted from Indian’s radical 841 model that had been designed for desert use by the US military during the war. These new forks provided a full five inches of wheel travel versus the meagre two inches allowed by the previous leaf-spring design. Though the rear still featured the same plunger-type suspension, spring rates were softened. These changes resulted in an even-smoother ride than before: a notable selling feature of the post-war models. This ’46 Chief was restored approximately 18 years ago. Recently imported and prepared for sale, this machine is in good running order.